In 1871, an order in council initiated a uniform land survey of the three Prairie Provinces as well as the railway belt of British Columbia. The land had to be accurately described and located through cadastral surveys before Letters Patent could be issued to a homesteader. The Dominion Lands Act required that each homesteader provide proof that the land had increased in value through additions (cultivation, building construction, etc.) costing labour and/or capital. 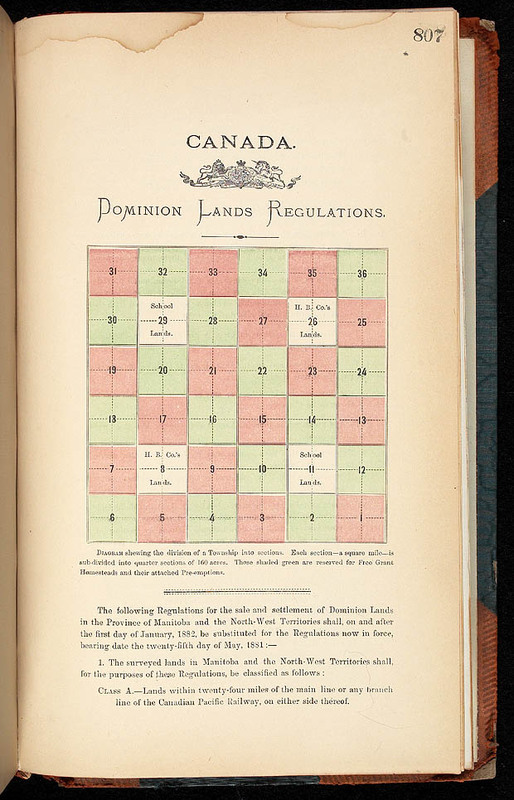 The Dominion Lands Act stipulated the improvements that had to be made to a land grant before a homesteader would receive a Letters Patent from the Crown. When a homesteader filed an application, the local Dominion Lands Office screened and validated the claim, and sent an inspector to the property to confirm that the improvements had been made. If the Board approved the application, it was forwarded to Ottawa for the "preparation and issuance of patents" by the Lands Patent Branch. Letters Patent were issued to grant or confirm title to a portion of land. They were the first title to land, and served as proof that the land no longer belonged to the Crown. They were issued by the Registrar General's Office of the Department of Secretary of State from 1867 to 1883 and by the Lands Patent Branch of the Department of the Interior after 18 July 1883. Figure 1 : Diagram showing the division of a township into sections. Diagram showing the division of a Township into a grid pattern of 6 squares wide and 6 squares high. These squares are called sections. Each section is numbered. Section 1 is positioned in the sixth column and sixth row. The last section is numbered 36 positioned in the sixth column and first row. The land system in western Canada was based on a unique checkerboard survey developed for the Prairies by the Canadian government. This system covered 200 million acres and is the world's largest survey grid laid down in a single integrated system. It led to the creation of more than 1.25 million homesteads. The basic unit of the survey is the 36-square mile township, which is divided into 36 sections. Sections are divided into four quarters or into sixteen legal sub-divisions. They are numbered from 1 to 37. Each section was approximately one square mile, 640 acres, divided into quarters of 160 acres. Townships are numbered from south to north starting at the United States border. They are numbered from 1 to 129 and 141. Ranges are numbered from east to west starting from each meridian, except for the west-to-east numbering used for the principal meridian and east of the coast meridian. Ranges are numbered 1 to 34. The federal surveyors established seven meridians, which acted as baselines for surveying and numbering the townships. The first (or principal or prime) meridian was established on the international border, near Emerson, Manitoba, at longitude 97° 27' 28'' W (of Greenwich). The second meridian falls on the 102° longitude, near the present-day Manitoba-Saskatchewan border. The third meridian falls on the 106° longitude (Saskatchewan). The fourth meridian falls on the 110°, which is the Alberta-Saskatchewan border. The fifth meridian falls on 114° (Alberta), the sixth on 118° (Alberta) and the coast meridian on 122° (British Columbia). Townships are described according to the last meridian that lies to the east of the township. Therefore, a homestead in southern Alberta is described as "W4M" or "W4" or west of the fourth meridian. Only lands located along the east side of the prime meridian take their description from the meridian along their west side. Therefore, a homestead near the Manitoba-Ontario border is described as located "EPM" or "E1" or east of the principal meridian. Click on the map to open a pdf version. To illustrate how the land numbering system worked, on this map you will see that Beechy, Saskatchewan, is located in township 22, range 10, W3. This series also includes a small number of grants between the years 1931 and 1950. This database contains over 670,000 references to land grants (Letters Patent) issued for Manitoba, Saskatchewan, Alberta and the railway belt of British Columbia between 1870 and 1930. To find out what is included, see the Records. The database was created many years ago with the basic technology available at the time. The data was later migrated into modern software. In the course of those migrations, some of the data was corrupted. For that reason, you may find incomplete or incorrect references. For example, some entries include more than one name, when in fact only one of the names is relevant to that document. Some entries include only an initial for the given names or only a surname. Try searching by surname only. Spelling variations in names was common in old records. The database entries reflect the spelling of the names as they appear on the documents. The Remarks field is relevant for only a small number of database entries from RG68. We recommend first trying your search with that field empty. Use the drop-down menus to select a section, township, range and meridian. You can leave any or all of those fields empty. For more information, see Description of the Western Canada land system. If you do not know the land description, you can search by name only. Some database entries are missing the land description, so try searching only by the person’s name. You can search by land description only, without a name. Use our Post Offices and Postmasters database to find the location of a place. Enter the name of the place in the Office Name box. Your search results will be displayed as a list showing the names and locations of each item. Click on the underlined Item Number of a record to access the Item page, which contains additional information specific to that record. Item Number: This is not part of the archival reference or the land description. It is a tracking number assigned to each entry in the database. Most database entries are references to land grants contained in the records of the Department of the Interior (Record Group 15). If the item description does not include an RG number in the reference, it means it is from RG15. Many of the RG15 database entries include a digitized image of the land grant. The RG15 database entries do not include a date. You can find the date on the digitized image of the document. For references that do not include a digitized image of the document, you can find the date range by looking up the liber number in the following list. Many of the RG15 database entries include a digitized copy of the relevant sectional (sheet) map that shows the townships and ranges for that area of the Prairies. Run your mouse over the image to see the map description. To view the three index maps for that series, see Mikan 213780. L. M. Sebert, “The 3-mile to one inch sectional maps of the Canadian Prairies”, Bulletin - Association of Canadian Map Libraries and Archives, 75 (June 1990): 1-11. Database references that cite RG 68 and/or Secretary of State are documents found in the records of the Department of the Secretary of State (Record Group 68). Those references relate to lands in Manitoba in the 1870s and 1880s. Microfilm numbers are not indicated in the RG68 database entries. Consult the chart below to find the relevant microfilm number. Envelope Grant: There was no patent issued for that section because it was a Hudson’s Bay Company grant. See Mikan 156393 for more information about the notifications for those grants. Note that the details in those notification registers (aperture card books) are what appear in the database entry. Folio: An archival term meaning page. FR: Fractional (part of the legal description of some townships, ranges and sections) For more information, see the Township System and 640 Acres, more or less. Liber: An archival term meaning book or register. For digitized documents, you can print the images or save the images on your computer. For database entries that do not include a digitized image of the document, see the following options. Enter the reel number in the search box, for example C-6715. If the reel is digitized, click on the reel number to see the images. You can browse through the page images; the content (text) is not searchable. Note that an image page number is not the same as the document folio (page) number. Keep in mind that there is more than one liber on each microfilm. Skip ahead to find the right liber and folio. For RG68 references, that collection includes many different series not related to Manitoba land grants, such as commissions and bonds. Search by microfilm number and disregard the title associated with that microfilm on the Héritage website. The liber number appears under each image. If the microfilm reel is not yet digitized on Héritage, you can request to have it digitized. Please use our online order form for reproductions. On the form, include the title (Western land grants) and the complete database entry. Indicate that you would like to have the reel digitized by Héritage. There is no charge for those requests. For other options, such as viewing microfilm on site, see our page about how to access the records. Homestead files contain information about the homesteaders, their applications and the process of obtaining title to their lands. Those files are held at the provincial archives. For Saskatchewan and Alberta, there are searchable indexes to those records. Note that the Alberta homestead records are digitized on the subscription website Ancestry, which is free at many public libraries. For grants made by the provinces after 1930 and land transactions after the issuing of the original grant, consult the relevant archives or land registry office. Information and links can be found on the individual provincial pages in our Places section.